As eLearning professionals we want to take our students on a learning adventure where they come out on the other side brimming with knowledge, inspiration and staggering awe for their superhero-like trainer. Ok, maybe these goals might be a tad unrealistic. Even the best eLearning designers can sometimes drop the ball when it comes to training because we forget that what comes easily to us might not come easily to our students and maybe, just maybe we might even overestimate our students’ abilities and interest level. 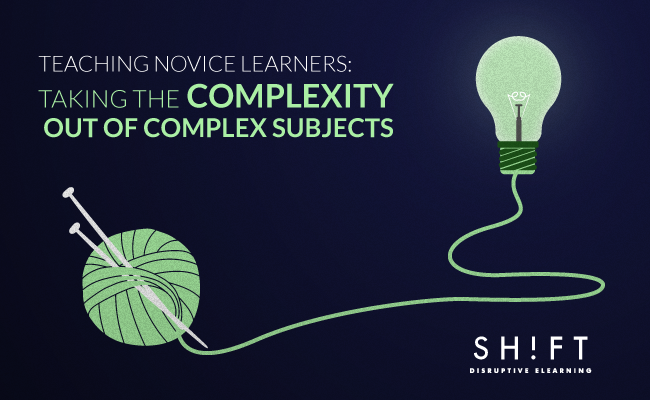 In order to effectively train, we have to evaluate how we present information and make it easily accessible to both novice and expert learners. The trick is though; we can’t dumb down information to the point that it sounds condescending. Remember, at one point there was a time even you didn’t understand the techniques you are now training, keeping that in mind will help direct your training style. Before anything else, you need to find out if your audience is at a beginner or advanced level of knowledge about your subject. 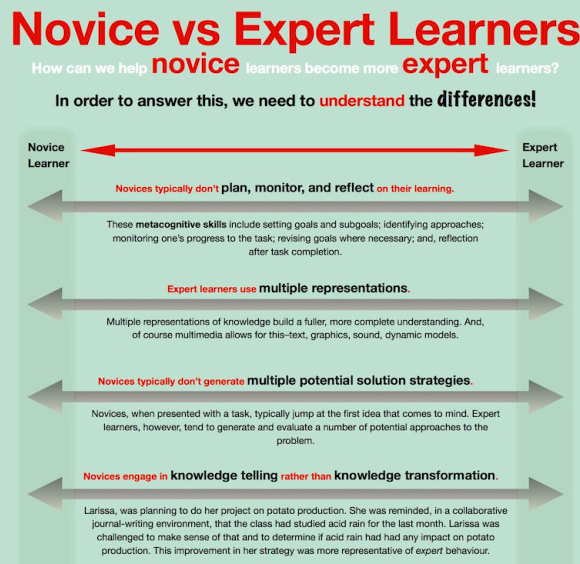 What’s the difference between expert and novice learners? Novice learners are well-intentioned folks who are typically brimming with enthusiasm while lacking actual knowledge about the subject being taught. They have limited or nonexistent experience with most of their understanding of the subject based on basic rules. Because of this, their ability to perform is rather limited. Experts, on the other hand, know a significant amount about the subject and how it’s organized meaning they cannot only understand but can add to a lesson. Their abilities allow them to take in the larger picture and not fixate on minor attributes (as summarized by Ross, Phillips, Klein, & Cohn, 2005). Expert learners are able to apply what they learn to create a far more intuitive way of working. Adult learners are adults and should, therefore, they shouldn’t be treated like children. Sounds simple enough, right? It is, but sometimes we need reminders to actually do it. Because adults have a wide existing knowledge base they tend to relate new information to existing information. Frequently summarize information to create ongoing existing knowledge to build on. Maintain focus on a single concept or application and give real world examples. Adults tend to be more practical than younger learners and will appreciate information that seems relevant to their actual lives not fanciful stories. Work in an element of self-direction to the material. Adults will learn better and stay more engaged if they are allowed to navigate some info on their own where they are encouraged to ask and answer questions. If you need to use acronyms and industry jargon, which you probably do, then take the time to define these things before getting started. Start by explaining the goal of the information first, not presenting ALL the info and then giving the conclusion. By starting with the end goal students are better able to see the connection of other information to what they are trying to accomplish. One of the best ways to make complex things easier is to break down a larger subject into smaller parts. When possible let students interact with a concept or tool to let them get a better feel of it and be more likely to remember how. Barring that, demonstrating slowly and clearly how to do something is the next best way. Repeat and rephrase your main points along with a summary at the end to give learners a few more chances to catch on. Bottom-line: You need to make learners feel safe to be dumb! The trouble with common examples is they are, well, common meaning we see them A LOT. Consider the last time you purchased a new chair for your home. At first this new thing really stood out and you admired and loved your new purchase. Fast forward to a few years later, can you remember the last time you even noticed it? This is the way clichés are. At some point they were new and drew attention to a point, but now are barely noticed. Even more importantly, clichés make your writing and courses look lazy as if you couldn’t come up with anything better to say than these tired phrases. Learners will start skipping and skimming information because you didn’t take the time to say something original, so why should they take the time to read? Novice learners invest time learning because they’re looking forward to get something useful out of it. They want something valuable not only in theory but also in practice. Offer them something practical and you’ll get their attention. In the end, these things are based on my personal experience and you will also learn from your students to create better and more effective courses. A final bonus tip: Teach as you would like to be taught and you will learn as much as your students will. Morin, E. (1994). Introducción al pensamiento complejo. Ed. Gedisa. Barcelona, España.